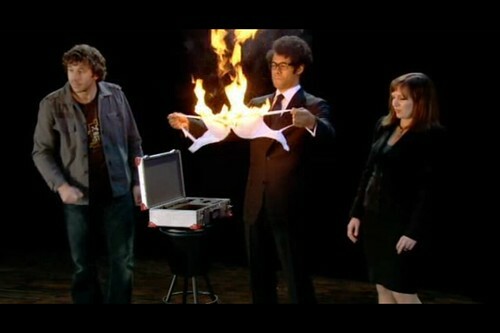 The IT Crowd is so awesomely funny. Tonight’s episode is so funny we’re watching it again. Completely hilarious. LOLed for about half the show. You must watch this now. Run don’t walk. Open Miro, then click Channels > Add Channel. Paste in the subscription URL. The latest episode (season 2, episode 5) should begin downloading. Watch episode and ZOMG LOL. Enjoy the earlier season’s episodes and all new ones which will automatically download to your computer. Ah, well, prepare to put mustard on those words, for you will soon be consuming them, along with this slice of humble pie, that comes direct from the oven, of shame, set at gas mark egg on your face. This entry was posted on Friday, September 21st, 2007 at 9:47 pm	and is filed under Cool Hunting, Funny, Media, RSS, Tools, Video. You can follow any responses to this entry through the RSS 2.0 feed. You can leave a response, or trackback from your own site.